Dr. Schmid is Chief Business Developer at SINTEF Materials and Chemistry in Trondheim with special responsibility for the area of medical technology, including nanomedicine. Her present research activities include the preparation and characterisation of micro- and nanoparticles, as well as the surface modification of polymers and polymer particles for applications in nanomedicine and various other industrial segments. Dr. Schmid is a Swiss citizen living in Norway since 1979. 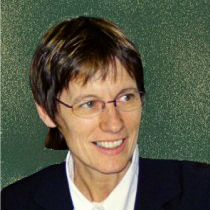 She gained her Diploma (1975) and PhD (1979) in Natural Sciences (physical organic chemistry) at ETH Zürich, Switzerland. She is a member of ACS, CRS (member of the board of directors (2009- present), Secretary and member of the Executive Committee 2012-2013, Treasurer-Elect 2013-2014, Treasurer 2014-2015), the European Technology Platform in Nanomedicine, the COST Action TD1004 “Theranostics imaging and therapy: an action to develop novel nanosized systems for imaging-guided drug delivery” (MC member and Vice Chair, 2011 – present), the COST Action FA0904 “Eco-sustainable food packaging based on polymer nanomaterials” (MC member, 2011 – present) and the External Advisory Board of the ERA-Net EuroNanoMed (2008-2011) and EuroNanoMed II (2013-). Dr. Schmid is author/co-author of 39 scientific publications, 17 patents and patent applications, 60 oral/poster presentations and 13 webinar, mass media and popular science publications.